Recently, Amy and I had a lovely vacation in northern California, spending the latter portion of it in the charming and constantly hilarious company of the Garing/Combs family – Amy’s aunt/uncle/cousins on her mother’s side (in case you care for that level of detail). On our penultimate day with them, we visited the “world-famous” Mystery Spot, just outside Capitola, CA., which the Garing kids had fond memories of from a tender age. Initially, I was skeptical that it was worth wasting a perfectly beautiful sunny day at some ridiculous-sounding shack in the woods trying to relive someone else’s childhood, but I couldn’t have been more mistaken. I’m here to tell you that the Mystery Spot is a must-see and it would be nothing less than a travesty if it were left out of any travel itinerary to the region. Our guide around the Mystery Spot was the well-informed and sparky young buck, Carl, who, if I’m honest, was the most unintentionally hilarious person I’ve ever had the good fortune to encounter. From his skinny, disheveled appearence to the way he accidentally dead-panned his delivery of the ironic sections of his schpiel – “this is no ordinary plank, it is the plank of mystery!” – he was absolutely first-class and had me in virtual paralysis of laughter for the duration of the tour. Strangely though, no-one else on the tour found him to be so funny. Even after we had left the Mystery Spot I was sitting in the back of the car giggling to myself. What could have caused this outbreak of the mirth, you ask? Well, the Mystery Spot, of course. Carl had warned us at the beginning of the tour that not only were peculiarly inexplicable reversions of the laws of physics known to occur within the confines of the “spot”, but weird physical symptoms were also commonly experienced by tour-takers, including changes in height, loss of balance and confusion. Clearly, my inner-ear was playing up because I very nearly experienced incontinence on more than one occasion and even Amy reported dizziness and light-headedness. 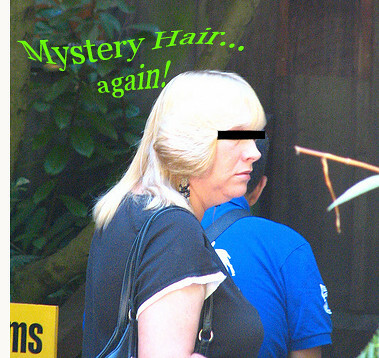 And, as, I think, this (below) photograph demonstrates perfectly, the Mystery Spot can do some terrible and awesome things to one’s coiffure. Later that day – when I had recovered much of my former composure – I noticed that the madness brought on by the Mystery Spot was spreading throughout our group. I watched transfixed in horror as Amy’s mother and aunt, sporting the hideous grins of the criminally insane, began laying out what they described as “dinner”. 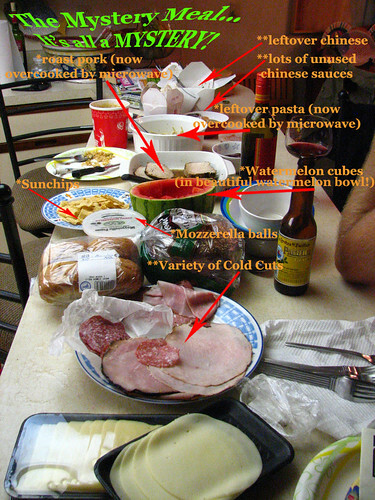 Before us lay a motley selection of three-day-old and poorly-kept Chinese food, a few scraps of the previous nights’ pasta that appeared to have been scraped off people’s plates, a greying mess of geriatric cold-cuts, some random bocconcini mozzarella sprawled in an ugly dish, a paper plate of wilting Sun-Chips, and a hollowed-out watermelon. I have rarely seen a less appetizing spread of food in my life and, at the sight of it, I immediately began to experience those same feelings of light-headedness and vertigo of earlier in the day. I fear what might have become of me had I been forced to eat any of this, for in those who, amazingly began attacking this dreadful buffet with gusto, there developed an almost instantaneous malaise of disappointment and depression that lasted the remainder of the evening and into the following morning, until only stout breakfast of eggs and bacon managed to restore their spirits. Interestingly, and this phenomenon I must report to the owners of the Mystery Spot one day because I suspect they are blissfully unaware of this perilous and hitherto undocumented reaction, neither my mother-in-law nor Amy’s aunt were with us on the tour that day. 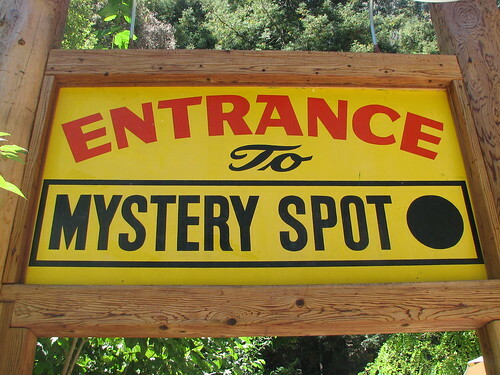 In fact, the former had never once even visited the “spot”, so just how they managed to contract this mania may become yet another of the secrets of the Mystery Spot that remain unsolved by science. Scary food and scary coiff!!!! No bad dye jobs here in Paris, and no 80’s hockey player hair! That food should all be thrown away. Love this post, too funny! There are a few things about this post that i particularly enjoyed. One, the video including Ali. Two, the description of Rose’s “hideous grin of the criminally insane”. This is all Ali was talking about labor day weekend. She even has a bumper sticker which I’m sure she will put in the front window of the beach house. I do believe you were not the only one that enjoyed the mystery spot. The only thing I recognized on the table was the Pacifico, which is magnifico (terrible I know). Interesting….reminds me something like a gravity hill. I hope Amy’s mom doesn’t read your blog. Ouch. This completely cracked me up! I wonder what would happen if you brought mystery meat to the mystery spot? Would it roll up and become something entirely different? Hmmm…. where’s Alton Brown when you need him? Mystery spot, huh? I bet if you go back, everything will be different and unrecognizable- like it never existed before. That place reminds me of the weird slanted house thingy at Six Flags Over Texas that I used to go to all the time when I was a kid. We’re in SoCal now, for almost 11 years, and we love that area up north. I’ll have to note this as a place to go next time. Who hasn’t been in front of such a table once at least his/her life? Oh, wow. Thanks for sharing this great story! everything said here is true. every single word. thank god most of us opted against touching the “mystery dinner”, the likes of which i had never seen before, and hope to never see again. i wish there was more video of carl. you know why they call this the “T” area, right? Do you reckon that scooby doo and friends ever drove the mystery machine to the mystery spot? btw that dinner made me throw up in my mouth a little. My favorite part was the Potluck of Mystery. Also, very classy, the way you put the black bar on that mullet lady’s eyes. She seems much more mysterious that way. this is one of the best comment sections so far. not only did some of my family weigh in and comment, well, people who don’t even really know us hit the nail on the head! needless to say, the mystery spot continues to “pay it forward” – for a $5 entry fee it’s still providing humor to my bleak, dark days. THANK YOU MYSTERY SPOT! Your dad was bragging on both of your culinary skills and how very much you enjoy food prep, exploration of tastes and textures and of course, eating it all. He explained also how much enjoyment that provides his heart, as well as his mouth and stomach! And lo- I go on your blog and see this wonderful recipe for ASPARAGUS, CRIMINI AND TOMATO TART. I can’t wait to make it, I’m salivating at your photos. I’m such ‘the cook’ that Dave suggested I could just get the cardboard facimilie of a stove when we redid the kitchen … so, I’ll show him!!! Wish me luck – but don’t worry, you’re in the Will. thank you, for your description of an “instantaneous malaise of disappointment and depression,” as this is EXACTLY what my parents and i experience every time we eat a meal and my grandparents house. holiday dinners can be okay, but those thrown-together dinners after an outing are sooo terrible. its all weird leftovers that have been in their fridge forever. and of course, theres the infamous Thanksgiving when grandma “forgot to make the pie.” you shouldve seen the dirty looks my dad and i were exchanging over the table. we were itching to get out of there and get some real food.